Through membership, we join our longing for personal well-being with our wish that all beings enjoy dignity, fulfillment, friendship, and the opportunity to serve our world. This deepening engagement with others further opens our hearts and minds, rousing unconditional confidence and joy. Through the generosity of practice, volunteer service, and financial support of our members, BSC can continue operating year after year, sharing the Shambhala wisdom tradition. 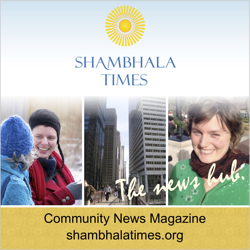 Come learn about all the ways you can engage in the Boulder Shambhala Center! And meet other new members while doing so!